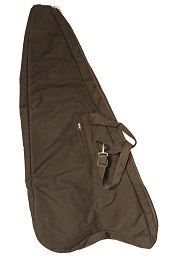 Gothic Harp, 29 Strings Nylon gig bag. Padded quilt gig bag for storage or travel. With a zipper pocket, hand and shoulder straps. Fits the EMS style Gothic 29 string harp (HGH29).